Not so long ago I was walking home with my partner just after 11 p.m. one Friday from a pleasant visit to the cinema in a well-off medium sized UK city that shall remain nameless, although my experience will be recognised by readers across these British Isles. The main drag is a wide and even architecturally distinguished street and was busy with mainly young people out for the evening. spotted a middle-aged man urinating against a wall in a side street. That probably not untypical experience came to mind when I read a report published today by Her Majesty’s Inspectorate of Constabulary called Antisocial Behaviour – stop the rot. My experience was trivial compared with some of the behaviour that the report rightly calls this blight on people’s lives. The main thrust is that the police response to this sort of stuff, already mixed at best, is what gets cut in hard times but mustn’t be. problem-solving capacity in neighbourhood policing teams. 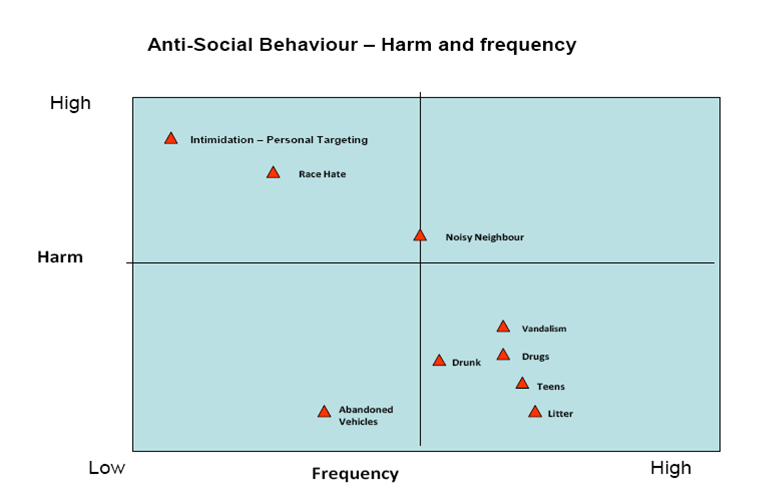 There’s an interesting diagram in the report showing the relationship between harm and frequency of different sorts of anti-social behaviour (you may need to click on it to read the small print). abandoned vehicles – Highways Agency, local authority: transportation, environmental services. The list is partial. And all of course potentially involve other players in the criminal justice system. there is little in the way of testing the value for money in approaches undertaken. HMIC inevitably link this to community safety partnerships but to this old hand all these characteristics ring true of much partnership working across the public sector. The report concludes that there are two alternative approaches to this blight. One it characterises as damage limitation, which would include better partnerhip working. an early intervention strategy, similar to those in health and education sectors. It will require reform of police availability and a refocusing on what causes harm in communities, rather than what is or is not a “crime”, or what can be managed out of police systems. To me that sounds like a need for even more effective partnership working, and not only across the public sector – not to mention trying to get to the root causes of the various behaviours. Big society and localism, here we come.